(3BL Media/Justmeans) – Low-income students wherever they may be in the world often lack the guidance and support they need to prepare for college, apply to the best-fit schools, apply for financial aid, enroll and persist in their studies, and ultimately graduate. As a result, large gaps remain in educational achievement between students from low-income families and their high-income peers. For many low-income students, they are the first in their family to attend college. Research from the National Centre for Education Statistics estimates that only 11 percent of first generation students earn a degree within six years of enrollment. This is why Marketo, Inc., a leading marketing software and solutions company has created an annual Global Volunteer Month, which is dedicated to supporting education projects for under-resourced and lower-income students. Marketo’s Global Volunteer Month is a central part of Marketo Engaged, its social good program that spans five core focus areas from supporting first-generation college students to creating custom content to educate learners at all levels. Global Volunteer Month is in its second year, where staff across nine of Marketo’s international markets will work together on a variety of programs designed to support and propel young minds on their journeys toward college and career success. 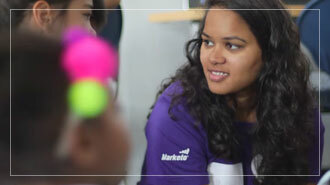 Marketo employees have already donated nearly 1,700 hours to their local communities in the past year. This year’s program is focused on skill-based activities, tapping into the knowledge of Marketo staff in addition to their time and energy for hands-on school rebuilding projects. Its offices based in Atlanta, Dublin, Ireland, Tokyo, Sydney, Portland, Ore., including its company headquarters in San Mateo, Calif., and in satellite locations internationally will participate in a variety of activities such as - collecting books to stock local school libraries and support early literacy programs; to organising career shadows for high school and college students at company headquarters; to leading skills-based workshops around science, technology, engineering and maths (also know as STEM), resume-building and marketing; to creating science and school kits on-site in Marketo offices worldwide. Educational attainment is important to a country’s economic success and in America alone, more jobs require more education as workers with only a high school diploma are finding it increasingly difficult to enter the middle class. The share of jobs that require postsecondary education has doubled over the last 40 years here. Yet, the overall gains in US’s college attainment have stalled, while other countries have continued to increase their share of citizens that complete college. In 1990, the States ranked first in the world in four-year degree attainment among 25-34 year olds; today, it ranks twelfth. So, with Marketo continued support to these lower-income college students, they will have the opportunities that they need to gain a degree. Marketo believes it is has a duty to give back to the next generation of innovators who will shape the future of the marketing industry.